Andrew Yip of BikeSanGabrielValley (BikeSGV) recently tweeted out a thread about a bike rider who got a ticket for riding on the sidewalk. A recent immigrant, he didn’t understand why he had been stopped, and had to wait around for the police to find a translator to explain it to him. The court’s response was an “offer” to serve jail time. “If you are poor, then you go to jail? I didn’t hurt anyone. How is this punishment fair?” Mr. L asked. Luckily for him, this happened in the city of El Monte, where BikeSGV has worked with the courts to set up a program that lets ticketed riders take a bike class in lieu of paying a fine. These diversion programs are common for ticketed car drivers, but few exist for bicyclists despite the 2015 passage of a law allowing them. Once he learned about the class, it still wasn’t easy for Mr. L to find it. He speaks both Chinese and Vietnamese, but doesn’t read either of those languages, so he can’t use email or even online maps. He tried for three weeks to find BikeSGV’s location, until finally he happened upon Yip in the parking lot of the former grammar school where the offices are housed. Another stroke of luck for Mr. L: Yip speaks Chinese. 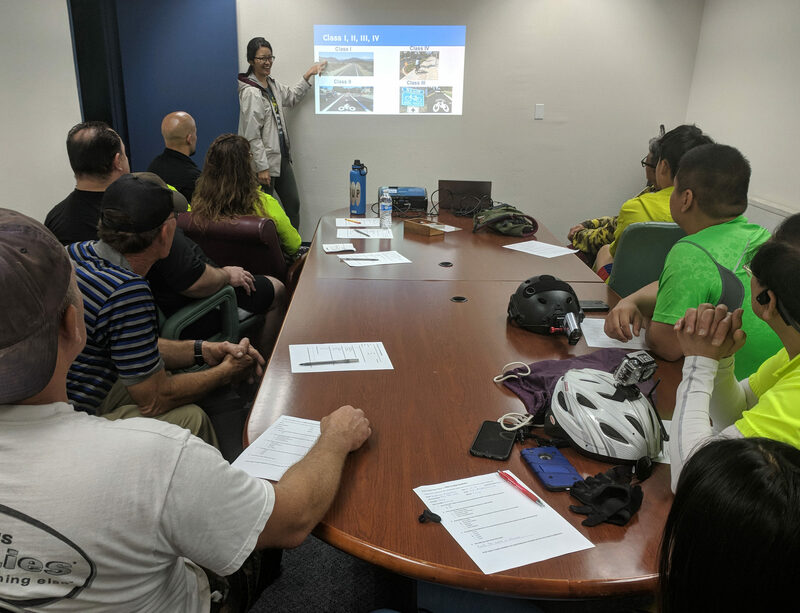 BikeSGV offers regular bike education courses, based on the League of American Bicycle curriculum. Their 3-hour class covers laws that apply to bikes and how to ride safely on urban streets. Their instructors speak Spanish, Chinese, and English, and the classes are paid for by grants from Metro. They are free to participants, and open to the public. They were set up as an educational program, and not every student in them is there because they got a ticket. But those that are receive a verification letter once they complete the class, and they take it back to the court to get their fines waived. Another key point to remember is that the education program is providing people with important information. It’s not just new immigrants who don’t understand traffic law. With driver education disappearing from school curriculums, young Californians pick up what they know about navigating the streets as much from observation as from any official program. It’s not a good educational model, and the supplemental education—maybe from LaughALot Traffic School after receiving a ticket—can be weak. But people don’t necessarily break the law because they don’t know about it. Yip’s tweet thread includes Mr. L’s explanation for riding on the sidewalk: he “already knew the rules of the road, but his reasoning for riding on the sidewalk was because it was dangerous to ride on the street,” he wrote. There are no bike lanes where he needs to ride, so where is he supposed to go? “I understand it is illegal to ride on the sidewalk but sometimes I feel safer to do that instead of on the streets with speeding cars. They don’t even look around here,” said Mr. L.
Mr. L’s experience shows that more diversion programs like BikeSGV’s are clearly needed. Right now, few cities have them. The state—and cities and courts and police departments—are relying on local advocacy groups to push to make them happen, instead of leading the way. And while BikeSGV—and Bike East Bay, the San Francisco Bike Coalition, the Marin County Bicycle Coalition, Bike Bakersfield, and other advocacy organizations throughout the state—along with a few cities like Sacramento and Huntington Beach are running successful educational programs, there are many more parts of the state that have nothing. And even in those areas it’s a lot to ask local advocacy groups to figure it out. If there’s no champion on the staff at the police department or court, it can be difficult to get anyone interested. BikeSGV has had success in El Monte largely because there is a single judge who oversees the traffic court there who has been an enthusiastic supporter. They have had less luck with other cities or court systems, such as in West Covina, where eight or nine judges share traffic court duties and staff have been unresponsive. But handing out citations is not the ideal way to educate people, and it remains a hardship for some even when the fine can be waived. As Yip points out, you still need to factor in that people work, and taking time off to get to court–twice–can mean losing a chunk of income. For people just barely getting by, that could be devastating. Mr. L was able to complete the course and get his fine waived. But he still has to ride his bike on the dangerous streets to get to work. Well, yeah, that’s pretty obvious. It is up to the individual to judge what he/she is willing to risk. For me, I was tired of hearing of local police engaging in ticket blitzes on bicyclists, instead of enforcing speeding, reckless driving, pedestrian right of way violations, and nearly constant stop violations by motorists. My city’s pedestrian and bicyclist fatalities have not budged, despite much Vision Zero blather. Accepting a spurious ticket in such a blitz just pushed me over the edge, and I found myself lying like I’d been born to it. To this day, I don’t regret doing what seemed morally right, even if illegal. Andrew, I am not speaking to this man’s experience at all, only about my own. I leave it to others to decide what works for them. I got a $350 ticket for a U-turn. No traffic anywhere near me but didn’t see the sign prohibiting it. I think I then had to pay another $150 or so for the safety course. It felt like a racket. I wonder what fines for running red lights, speeding, distracted driving, etc. are? Where I live, with the exception of distracted driving a 240 dollar fine would be about the most expensive ticket one would expect to receive for a road violation. Further, at least where I live, giving false identification to a police officer is a far far more serious crime than any bike ticket. Isn’t the idea of paying not to go to jail fundamentally criminal? OK, so then pedestrian tickets would be similar? Like for jaywalking? Hmm, don’t know the answer. Maybe easier to stop? Maybe cops are guilty of going a bit over the speed limit or rolling a stop sign one too many times? When you do that, you don’t empathize as much with those that aren’t like you-a car driver. The man didn’t speak English. The cop had him sit on the curb for 30 minutes before finally having a translator come go through the entire process of citing him. Or just politely tell the police you left the house or office without your wallet, and give them a phony name, address, and social security number if they ask for it. I find avoiding a $600-$1000 stop sign violation this way is a risk I have been willing to take. It is highly unlikely they will search you or arrest you on the spot, as unlike driving a motor vehicle, you are not required to carry identification while walking or riding a bike. Of course you have to be ready with this sort of story, and you have to be willing to risk spending a few hours in jail and paying a bigger fine for lying to a police officer. But it is very unlikely police are going to haul a polite bike rider into the station for a minor violation. Worked for me. I leave it for others to decide for themselves. Bike diversion classes make complete sense. They lower the cost of the ticket to something closer that fits the crime and they get more people exposed to bike safety classes. Win win. If citations for the low paid are a problem then why only for bike tickets? No, I’m saying it looks like a misquote or typo, unless I’m not understanding. > “Ride on the sidewalk or you’ll get fined several days worth of your wage/jail. Not safe? Too bad, no bike lanes for you. Go get a car,” wrote Yip. To me this reads, “Ride on the sidewalk, or else you’ll get fined.” However, this isn’t correct, right? It should be, “Ride on the street, or else you’ll get fined.” When you say, “Not safe? Too bad . . .,” surely you’re not referring to riding on the sidewalk as being unsafe. In other words, I’m not commenting on the content, but the grammar. In fact, I completely agree with you and sometimes ride on the sidewalk myself when it’s too dangerous to be on the street! And you get run over? > “Ride on the sidewalk or you’ll get fined several days worth of your wage/jail. Even when caught on video, motorists confidently get away with reckless and malevolent driving. The deal hasn't officially closed, but in all likelihood it will soon be possible for the driver of an Uber car to park in a bike lane and endanger the rider of an Uber bike. Stiffer Fines for Illegally Parking a 20-pound Scooter than a 20,000-pound Truck? SFMTA's new fine structure has some safe-streets advocates fuming.